Finally, all that GPU-intensive Bitcoin mining will pay off! 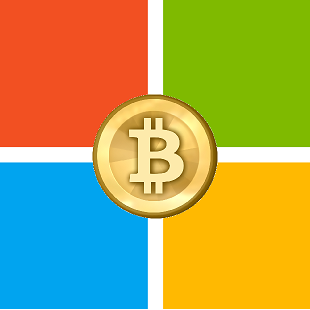 For those who have evolved beyond the credit card and cold hard cash, Microsoft has added Bitcoin as an acceptable form of payment in several software products. The new payment method is now being accepted on Xbox, Windows, and Windows Phone, meaning you can purchase all manner of software in the Microsoft ecosystem without dipping into your checking account. The cryptocurrency adoption goes live today, but there are a few steps involved. Anyone interested in using Bitcoin will have to use the converter of Microsoft's choice -- BitPay. You trade in your currency through the middle man, much like exchanging U.S. Dollars for Euros when travelling abroad. BitPay, which determines the exchange rate on its own, then adds the exchanged Bitcoin to your Microsoft account, where it's listed as your local physical currency. The process is similar to adding any other form of payment to your Microsoft, like a new credit/debit card, PayPal, etc. Bitcoin isn't yet being accepted as a direct form of payment by Microsoft (hence all the conversion/Microsoft wallet talk), but this could be a step in that eventual direction. "For us, this is about giving people options and helping them do more on their devices and in the cloud," says Eric Lockard, corporate vice president of Universal Store at Microsoft. "The use of digital currencies such as Bitcoin, while not yet mainstream, is growing beyond the early enthusiasts. Additionally, there's a cap on how much Bitcoin can go in your account -- up to $1,000 in Bitcoin can be added per day, with a total cap of $5,000. Sadly, no support for Dogecoin was announced. If it's good enough for NASCAR, it's good enough for Microsoft, I say! This is a pretty huge leap forward for the cryptocurrency. And it doesn't affect me directly at all. Hmm. Really surprised by this move though. Goes a long way in legitimizing it. Bitcoin is still a thing? Hasn't it been months (or years) since it was even profitable to mine given how the cost of electricity is greater then the value of the coins themselves? Not that this matters, this joke of a currency is still just a fraction of a fraction of the way to becoming mainstream (which is supposedly the goal). Hell after all this time it's still not even at the same level of use as most national currencies, I'd be genuinely surprised if it even made it into the top 100 most used currencies. It's probably right behind WoW gold farming. i hoped bitcoin would be dead at this point oh well. Bitcoin is still very much a thing, just not a mining thing. the only "profitable" mining is with ASCI machines now, forget about regular computer or GPU farms. Bitcoin is only one of many cryptocurrencies btw, and they are all being mined. The currency really comes from speculation and trading now more than mining. sort of, you know, like real money. No currency got mainstream quick. the first paper currency took DECADES to become mainstream in a single country. even when government officialy changes currencies and enforces it it still often takes many months for things to get into gear, and bitcoin is being opposed by same government. its completely reasonable that it may take as much as a hundred years for cryptocurrencies to become mainstream and it always was. yes, the media blew it way out of proportion and so did the enthusiasts, but its still a thing. how much the currency is used is hard to measure. same is true for regular currencies too. what is clearn is that very little marketplaces accept them, which limits its usage, but then how many markerplaces accept wow gold? Also a fun fact: Dogecoin is actually 5th largest cryptocurrency now. One Doge to rule them all. we dont always get to force everyone live the way we hope. Bitcoin may still be alive, but it's also a joke. Despite the best efforts by its proponents, the rate of adoption has basically flat lined. Unless there's a radical change it will forever remain a niche product. I also fail to see how a joke of a cryptocurrency being in the top 5 does anything other then hurt the image of cryptocurrencies as a whole (not that it ever had trouble doing so given the long list of reasons why they're a bad idea, both as investment and as a currency). Like i said, you want it all and you want it now, but it never works that way. it will take years, decades, for new currency to strenghten itself. especially of other currencies remain strong thus negating the need and slowing it down. Whether bitcoins will become a form of regular payment remains to be seen, however it seems that at least the speculation buble crazyness is over for now. Bitcoin is heavily overvalued now due to speculation which did more harm than good to it. Dogecoin started as a joke, sure, but for a while there it was actually the most profitable currency to mine because of it. As far as it being a joke, we had plenty of those in real life as well. for example there was a currency in my country 25 years ago that is now considered "animal" currency because it was basically pictures of animals and everyone considered it a joke. it was much weaker that dogecoin is now but it was a necessary inflation control step. There are currency in Canada right now with dinosaurs on it with a glow in the dark skeleton. Now you want a real joke currency try the GabeN coin. that was never treated as anything more than a inner joke. The merits of cryptocurrencies can be discussed long and hard, but im not really the person to stand in their advocacy. for one, i dont use them myself, for two, my language skills are hardly the best. Just worth remmebering, there is a long list of reasons why paper and electronic currencies we have now are bad ideas too. its not about that though, its about whether the goods outweigh the bads, just like everywhere else. and to be honest, having a currency that is digital without the bank intermediaries and abilities to block transfers because "we dont like you" is pretty large goods.